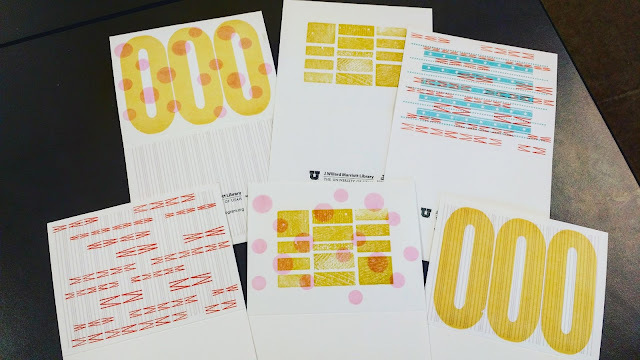 I've been planning to go this letterpress mini-workshop, up at the University of Utah (or the U, its what everyone calls it) for a couple of weeks now. I've been wanting to try out letterpress for sometime now, I thought this was my opportunity to check it out. So my sister Karen and I went to Salt Lake last friday to attend the "Print Appreciation" held at the "U" campus at the J. Willard Marriott Library. The public were welcome to try out the school's antique presses, they were all set up with modular design, all pre-inked so the participants can make their own designed cards. The cost was $5 for 1 or $3 for $10. Of course I made three for myself and Karen also made several cards for herself. They were selling some of their books and I bought a couple of them for a $1 for my scrapbooking. 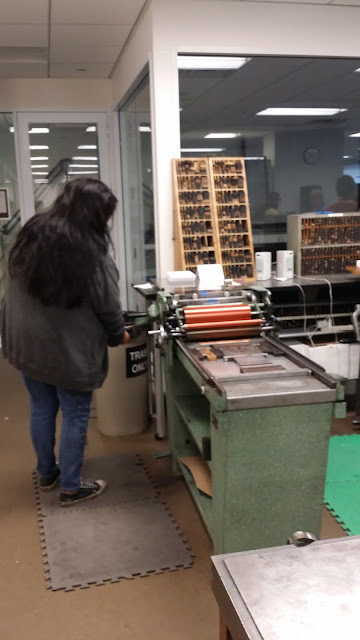 The instructors showed us how to load the press with our notecards and then they let us try on our own. They had several pre-inked presses for us to try, we just went around and chose what design we liked best. The instructors were really nice, helped us when we needed and very friendly to everyone. I had the best time, I felt like a kid in a candy store mesmerized by all the presses and the little shelves that held all their blocks of letters. I even picked up a flyer for classes for letterpress. Hmm, maybe just maybe I might be thinking of taking classes for this, maybe. We stayed for over an hour, it wasn't too long. They also served refreshments so we stayed for that as well. I enjoyed myself, it was fun, different and I wanna do more stuff like this in the future something I really liked to do. 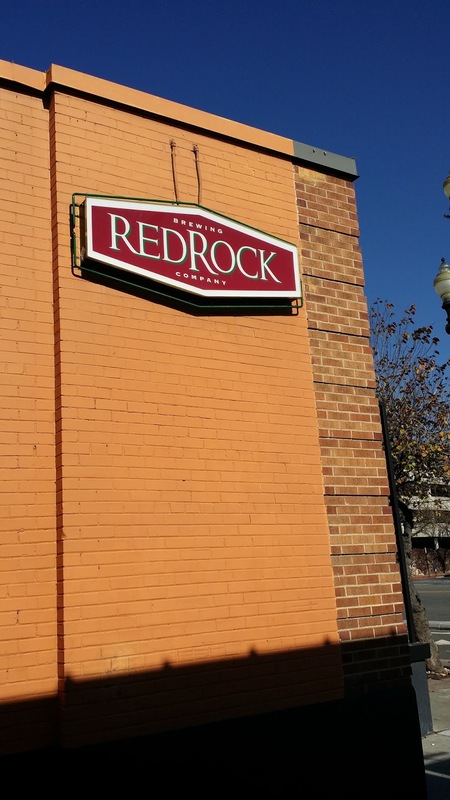 Before we head out to the university, Karen and I went to Red Rock Co. for some grub to eat. Luckily, we got there before the lunch rush hit. It's been awhile since we ate up here and we chose this place because we haven't been here yet. 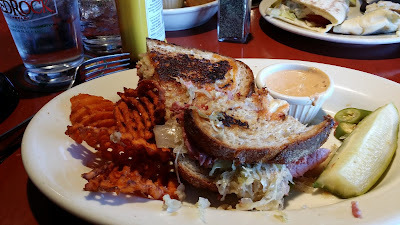 I picked the grilled reuben with sweet potatoes, it was so good! the sauerkraut wasn't to strong or overload with it, the bread was a little weak. The stuffing kept falling out and I was making a mess. The sweet potatoes fries was crispy and came with some dipping sauce. Yummy! Karen had the tuna salad sandwich with a side salad. She thought the side salad would be a small plate but it was pretty big, and she didn't even finished it. But she did enjoy the tuna, wasn't to messy or overcome by the dressing. Overall, it was pretty good place. Our server was pretty nice and the atmosphere was pretty busy with a lot business lunches that was happening. Karen wants to try out the dinner here, I'm down for that when we get the time again. Overall, our Friday afternoon was quite a awesome day. I was happy to attend the Print Appreciation at the university and had some great food for lunch. I'm happy to share my friday fun with you all. I hope there will be more things to do in the coming months. Now Thanksgiving and Christmas is coming up we shall see, I still working on my little junk journal and figuring out what cards to make for Thanksgiving for friends. I hope your weekend was a great, and I hope week ahead will even be better, until nextime. 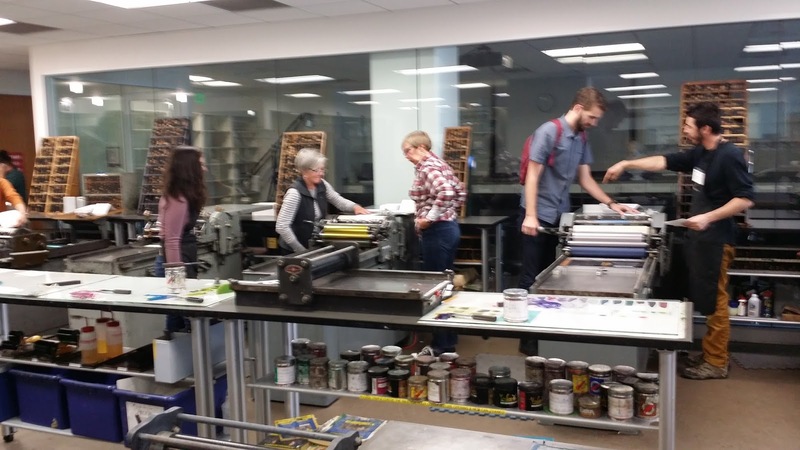 the letterpress we tried out. the three on top were Karen's cards, and mine are on the bottom.